This photo is actually getting pulled off Facebook...so, the photographer added a lil text and renamed the file. Pass it on. I'm SURE the media doesn't want this one out there. Share it as much as you can. 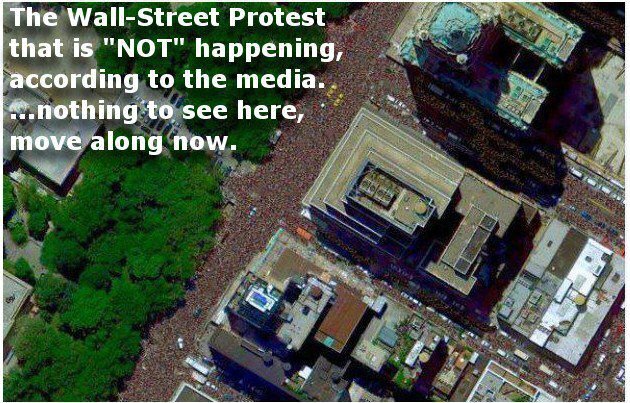 Leaving aside the claim that the image is being pulled from Facebook, or that "the media" denies the protest is happening, is this an accurate photograph of the Occupy Wall Street protest? It doesn't ring true to me: It seems far more populated than other photos of the event would suggest, and I would have thought more flags and placards would be visible, but I don't know. This blog post that did some investigation on that photograph quite clearly shows that it is a photoshop job. Furthermore, the originator of the photoshop job has as much admitted to it being photoshop, and he did it to bring attention to the movement, even though he is not involved in it. If you peruse the two blog posts (I know, not the most reliable sources), they do a lot of research for us. They link to the original photographs from google and highlight how the photoshop was done. Not the answer you're looking for? Browse other questions tagged history united-states politics .